An angler adjusts his tip-up in early January on Ray Lake near Lander. As Wyoming's ice derby season reaches full swing, experts say success starts before you drill your first hole. 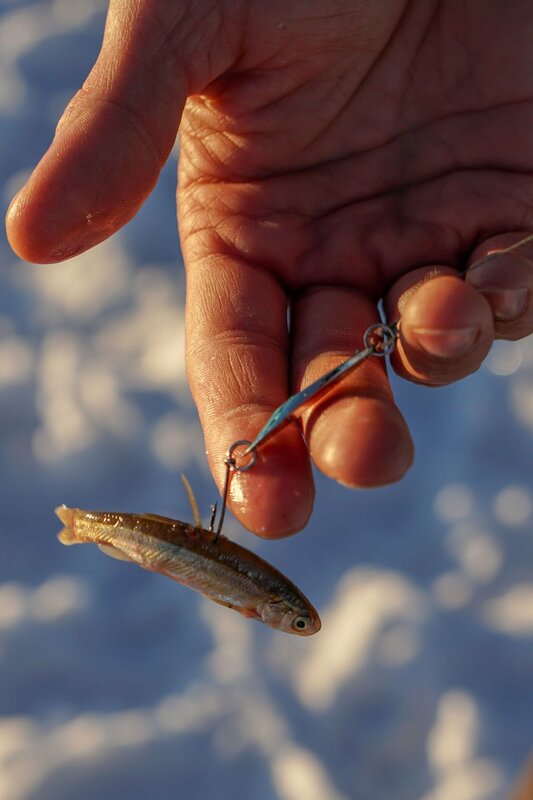 A minnow dangles above a hole in the ice to be used as bait. Plan ahead if you want to use minnows; it can sometimes be tricky to find ones for sale in drainages where they are legally allowed to be used. A tip-up sits on the ice on Ray Lake near Lander as the sun begins to set. An angler sets tip-ups on Ocean Lake near Riverton. The flier for the Pathfinder “HAWG” Ice Fishing Derby lists winnings of up to $57,000. It sounds like a lot, and it’s for real. The derby contracts with an insurance company to generate a random weight to the hundredth of a pound. If the fisherman with the largest walleye or trout matches the assigned weight – exactly – he or she could take home a check of $25,000. Each. The heavy purse doesn’t go out every year. In fact, the last winner was a Casper angler named Dustin Russell in 2010. His walleye weighed exactly 2.76 pounds. But even if one of the hundreds of anglers that pay $35 each for the opportunity to try and catch a big money fish through the ice on Jan. 26 and 27 at Pathfinder Reservoir doesn’t win the grand prize, first place is still a cool $1,000. In 2017, the tournament drew more than 600 people. Last year it was cancelled because of thin ice. This year, organizers are preparing for what could be the biggest event yet, said Jackie Martinez, commodore of the Pathfinder Boat and Fishing Club. If it sounds like fun but you’re no ice fishing professional, you should still give it a try, said Casper real estate broker and ice fisherman Todd Kittel. Kittel has placed a fish in the top 10 for five out of the past six tournaments. “If someone wants to go and try to catch a fish, all they have to do is just show up. As far as trout go in this area, they’re pretty opportunistic, if it smells reasonable and looks right they will try and eat it,” Kittel said. For anyone thinking of joining, Kittel offered some tips on how to make the most out of your derby, or just your afternoon ice fishing. And most of his secrets start before you hit the ice. If you’re going somewhere new or even your home water that you haven’t fished yet this season, call local bait shops or sporting goods stores for recommendations. Shops often have fishing reports that will let you know ice thickness, if certain jigs are working better than others and roughly where to try. You can also scan Facebook pages and websites dedicated to Wyoming ice fishing. You should also check on bait. Minnows can be hard to find, for example, and sometimes must be used in specific drainages. Make sure you can get them ahead of time. Taking a look at a local map early can save time when you get there by identifying access points and convenient paths to bays or rocky points, Kittel said. You can also buy bathymetric maps that tell you what types of features are underwater, like drop-offs and rock piles. And bring a GPS in case a blizzard hits or you fish until dark and can’t find your way back to your vehicle. Don’t wait until you’re on the ice to make sure your line is in good shape and pole and reel are working. When in doubt, change your spool. You’d hate to lose the winning fish because of old, cracked line. Also make sure your ice auger fires up and you have the necessary safety equipment. Kittel recommends bringing and wearing life jackets and ice picks that hang around your neck. The jacket can keep you up if you fall through, and the ice picks can help you gain purchase on the ice to crawl out. Maybe you’ve had luck off a certain rocky point in the past. That doesn’t mean it will work again. You could also show up in the morning and another group is fishing in the exact same spot. “Despite it being a big reservoir, Pathfinder can be crowded during the derby. You better have another place to go and fish or you will find yourself confused and not know what to do.” Even if the reservoir is crowded, be respectful of other anglers and don’t crowd them. If the fish aren’t biting, move. Kittel and his team will sometimes stay in the same spot for two days if the fishing is good enough. Other times they will move often. Make sure your setup can easily pack down and transfer somewhere else. On the day of the tournament, arrive early and get started. “Too often I have come in and brought fish that could win a prize and there will be dozens of folks standing around at the fish scale waiting to see if they won something,” he said. “They could be fishing right then. They could be winning the fish of the derby. We’re not all business about it, but we’re also there to catch some fish.” Bring food, drinks and warm clothes onto the ice so you can keep searching for that winning catch. Ice fishing tournaments continue around the state from the famed Burbot Bash on Jan. 25 to 27 at Flaming Gorge Reservoir (www.burbotbash.com/) to the Wyoming Ice Fishing Tournament on Feb. 2 at Granite, Crystal and North Crow reservoirs at Curt Gowdy State Park (wyofishtourney.com). The Wyoming Game and Fish Department and other state officials outlined tips for staying safe on ice this winter. Check the thickness of any ice before venturing out onto it, and continue checking it every 100 to 150 feet. Four inches of clear ice is usually safe for fishing. Clear ice is stronger than cloudy or white ice, which has frozen, thawed and refrozen and is not always stable. White ice can also be formed by air bubbles or frozen snow and is much weaker than clear ice. For white ice, double the recommended thickness. Stay off of rivers. Currents underneath can create unknown hazards. Be cautious of warm winds, which make solid ice one day unsafe ice the next. Take a buddy. Having a friend along means someone can throw you a rope if you fall in. Wear a life jacket and carry a flotation device on a rope. Carry some kind of ice pick to help you grab the ice should you fall through. To make ice picks, hammer nails in the end of pieces of an old broom handle. It only takes several minutes in frigid water for your hands to stop working. With ice picks, if you fall if you can jam your ice picks into the ice instead of grasping at the slippery surfaces. Keep dry clothing and hot liquids on hand to help avoid hypothermia from falling in the icy water. Don’t drive vehicles or ATVs onto the ice. Avoid pressure ridges, which are large cracks or heaves caused when ice expands and contracts and are often weak and thin.